A few years ago I started wearing black yoga pants on a somewhat regular basis (read: everyday). I don’t know why, exactly. At that time I had never even attended a yoga class and I had a strict personal rule about no sweatpants in public. So why, all of the sudden, was I willing to strut about town in exercise clothes? I wore them to the grocery store, on dates, and even to work (casual Friday only, of course). What I didn’t know then was that the yoga pant trend was a trickle down effect from Lululemon – a company that specialized in high-end athletic wear. Without ever having heard of this company or knowing anything about them (full disclosure: I bought my yoga pants at Wal-Mart) I had unknowingly embraced the Lululemon philosophy of health and wellness as an everyday part of life – not something to be left in a silo, reserved for an hour at the gym. Yoga pants became an integral part of my daily wardrobe – they became part of who I was. I loved that by wearing them I was signally to the rest of the world that I took my health and well being seriously. Just wearing yoga pants made me feel empowered and healthier. Eventually I even started doing yoga. The marketing team behind Lululemon tapped into consumer’s desire for health and wellness, riding the holistic health wave of the 2010s. They skipped traditional advertising and instead focused on grassroots campaigns in communities using an Ambassador program. By connecting with professional fitness instructors (yoga teachers, gym personnel) Lululemon was able to leverage word of mouth advertising and grow their business for a fraction of the more traditional campaigns done by competitors like Nike or Under Armor. Each of the companies 1,500 ambassadors have been carefully vetted to ensure they represent the core values and mission of Lululemon. In addition to their ambassador program, Lululemon gives each customer a reusable shopping bag that is decorated with dozens of motivation quotes – like a real-life Pinterest board. This sense of inclusion adds value for consumers – they feel special, like they are part of an exclusive club. This sense of inclusion is extended to the company’s social media profiles. For example, Lulelmon’s official Instagram account is a mix of company posts and user generated content. Lulemon’s marketing team understands who their audience is. They also understand what their audience values. In addition, they know where their audience hangs out – both online and in real life. The success of the company’s marketing can be seen in the staggering growth of Lululemon, which started as a single start up in 1998 and is now a publicly traded global company worth 8.8 billion in 2016 (Forbes, 2016). When it comes to your creative business, do you know who your audience is? Do you know where to connect with them online? Do you know what your audience needs? What is the problem you are going to solve for them? How are you going to make them feel included in your tribe? Sign up with your email address to a free creative business printable, delivered to your inbox every Monday! This week, in celebration of my birthday, I sending out three free printables, rather than just one. My birthday bundle includes a pretty floral day planner and two matching word art printables - perfect for your home or work office. It's hard to believe we are almost half-way through October! I've been busy working on some bigger projects and launching a brand new shop over at The BOM - be sure to check it out! I'd love to hear what projects and goals you have planned for the fall. Be sure to connect with my on Facebook and Pinterest, for more life design resources! Happy Monday! This week’s free printable is a Daily Habit Tracker, to help you stay on track for whatever big beautiful goals you’ve set for yourself. Have you ever started a new habit only to forget about it by day 3 or 4? I’ve done this so. many. times. I start out with the best of intentions only to give up out of boredom, frustrations or fear. Part of my trouble is that often the goals I pick for myself - the habits I want to change - are not the rights ones for me. And I’d set up an elaborate work out plan and be motivated to stick with for approximately 72 hours before I crash and burn. This type of fear based motivation (comparing yourself to everyone else) can only carry you so far. When you set a goal and work to change or establish a new habit in order to reach that goal, you know exactly WHY that goal is important to you. Your WHY is the motivation that will keep you going, even when you don’t feel like it. For me, deep down, I’m pretty comfortable with my body. I exercise to feel good, not to shimmy into a bikini. And if I am being totally honest with myself, I don’t really care if I look like Kate or Reese. What’s important to me (my WHY) is taking care of myself both physically and emotionally - which exercise helps me do. Do you struggle with setting the right goals for yourself? I’ve put together a FREE WORKBOOK to help busy women just like you set and get the right goals. You can grab it in our Free Resources Library. What are some habits in your life that you are trying to change? I’d love to know what's on your Habit Tracking Worksheet! Drop me a line over at Facebook or Instagram and be sure to follow me on Pinterest for even more Life Design resources. Happy Monday! It’s officially Autumn! Yay! While Pumpkin Spice is not my thing, I do love the start of a new season! This week’s free printable is a set of pretty floral monthly dividers. You can use these for dividing up your personal planner, in your family budget binder, or for other projects that require time management. I like to use these pretty printables as part of my life design toolkit, to help me plan out my goals and inspired action for the coming year. And remember, no one says you have to wait until january to start a new project or get started on a big idea. You can start planning today for the things you’d like to accomplish in 2019! 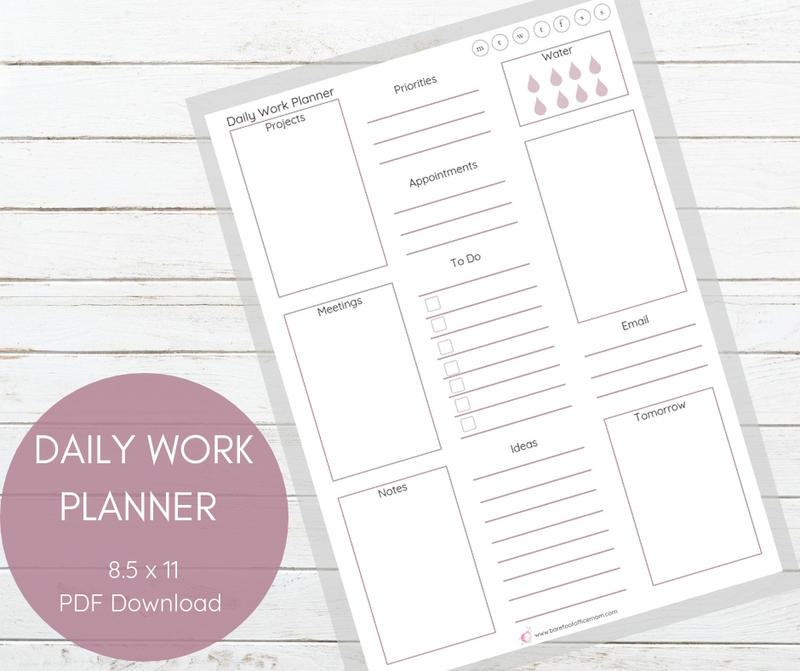 How are you going to use your Free Monthly Calendar Divider Printables? Leave a comment below of tag me on Instagram @lorri_barefootofficemom. Be sure to sign up for the BOM Newsletter for a new printable delivered right to your inbox every Monday! This week's free printable is all about taking control of your workday. I developed this printable as a way to take back my time in the office. There's a space for ideas, to do's, appointments and priorities. I also added a section called "tomorrow" so I had a place to jot down notes that I needed to remember for the next day. my Big Beautiful Goals workbook in the Free Library at The BOM (tell your friends!). What areas would you like to change in your life? I'd love to hear about them! Be sure to connect with my on Facebook and Pinterest, for more life design resources! Working Mom of Four, Life Designer, Time Management Expert, Lover of Pretty Office Supplies. Dedicated to Helping Working Moms Create a Life They Love.